I originally bought inexpensive eBay knock-offs which were terrible, and now sprung for the real deal- real MB parts. 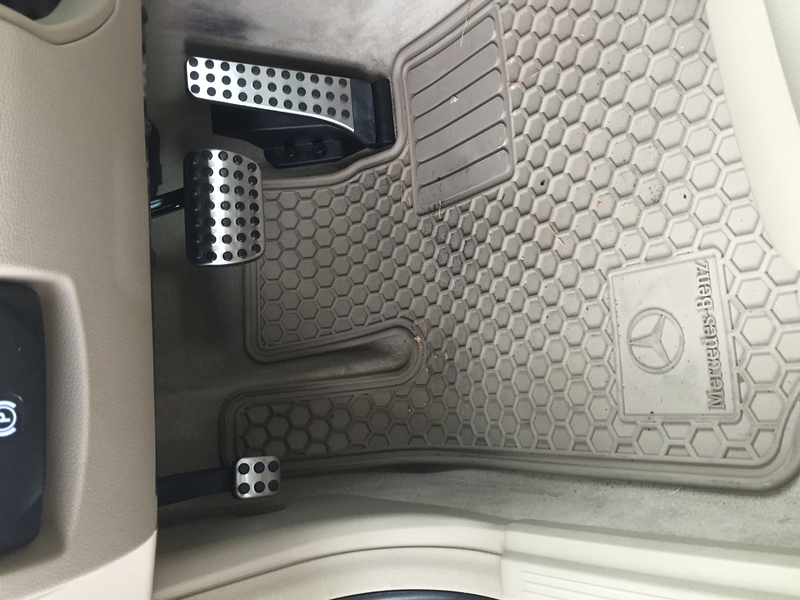 Super easy to install- need a 12mm socket to unbolt the old gas pedal and install the new gas pedal. Old foot brake and parking brake pads slide off. I moistened the inner edges with alcohol and the new ones installed in a jiffy. While the alcohol is wet, it acts as a lubricants, but it dries/evaporates very quickly. Total time, including looking for my socket wrench, was 15 minutes. PS- why is the image own my screen rotated 90 degrees? Last edited by Zavato; 07-31-2016 at 01:11 PM. +1, looks great. I always check to make sure image is correct rotation on computer before posting. That's always worked for me. Great look. I put the same design on mines but I got some random brand off of Amazon. Regardless much better then the black ones that came with the car. A PITA to get on though, I just cut the old ones off with a heavy duty scissor and the new ones slide on with an opening already on them. Need to see the dyno chart or it didn't happen. Nice job on the pedals man. I subscribe to the 10% rule- HP increase is equal to 10% of cost. Isn't that how it works? I put mine on a few weeks ago. My only complaint is if you drive with your shoes off it's not real comfortable on your feet. They look great though! I hate even driving with flip flops on. It feels foreign no pun intended lol. I know people who do it all the time and I just can't but with no shoes on I'd feel like a new driver all over again.